The billionaire father of Dodi Al Fayed, who died in a car crash with Diana, was testifying in the inquest into the couple's death. And within minutes, the teary-eyed Egyptian called the August 1997 crash "hot murder." "I will not rest until I die. If I lose everything to find the truth," Al Fayed told the court. When an inquest lawyer challenged Al Fayed as to why he didn't tell everybody as soon as he knew about Diana and Dodi"s alleged engagment, Al Fayed tersely replied, "it was one hour before they were murdered. Am I going to announce it after they were dead?" He also added his allegation that Prince Philip -- the husband of the Queen -- couldn't bear to have a Muslim be stepfather to the future king of England. 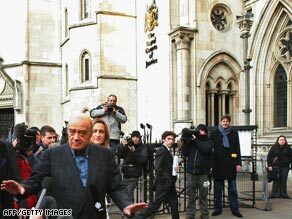 "Diana suffered for 20 years from this Dracula family," Al Fayed said, to chuckles inside and outside the court. Some of the exchanges would be funny, were it not so clear that Al Fayed is still grieving for his son -- and is clearly disturbed by suggestions his version of events are "hallucinations." I would normally be writing from London or some European city on a quick road trip for CNN. This month I am in New York temporally covering the markets and business news. Though I was born on the East Coast of the USA, London has been my home for 18 years, so it always amazes me how different it is to cover news in America. The evidence could not be starker than in general news. This week, 24 hours after a multiple shooting, CNN had the brother of the killer on air live talking about his dead sibling. In Europe you would be lucky to have a still photo of the shooter, let alone any video of a family member after the first 24 hours. The same principle applies in business news, though thankfully its not usually about life and death. My first week here, we were at the new Gucci store on 5th Avenue, less than 24 hours before the opening of the luxury brand’s largest store in the world. It was not an exclusive, so the CEO Mark Lee has to take an hour out of his schedule for us and then for each of our competitors. It may be a European brand, but he is San Francisco-born and has an American feel for news. Sure, it was all PR and we were lead around to show how “marvelous” everything was, but he did not shy away from questions about a possible U.S. recession, about the weak dollar and about opening a behemoth when many Americans are spending less. In Europe we may have been allowed in a store for the ‘pre-launch’ party or something. However, we may have been behind ropes or only allowed access to certain parts of the floor. In addition, we certainly would be forbidden from interrupting the last minute panic all stores suffer. In the case of Gucci, builders were shushed, ladders moved and Gucci-hired photographers from Hong Kong told to get lost so their lights did not bother us. The difference was even starker the night before Gucci. We covered a “cougar” speed dating evening. “Cougars” are older women (over 35) interested in meeting younger men. In this case, some women I think were over 45 and some of the men were certainly under 25. The twist this night; the women had to be rich, with more than $4 million in the bank. Sure, it is a bit of fluff for a Valentine’s piece, but only a handful of the ladies refused to be interviewed. One, Gail, was happy to spill all for the camera; an honest assessment of why a wealthy older woman who is in fashion would subject herself to a very public evening. Even if this kind of event would take place in London or Paris, I know we would have few people to interview. Americans do all seem to be waiting around for their 15 minutes, whether for good news or bad. You can certainly question that. Nevertheless, when it comes to business news, the willingness of companies to co-operate, the willingness of analysts to travel through mid-town traffic for a 15-second sound bite, the willingness of the average person to comment about anything is refreshing. I don’t look forward to March when I get back to trying to get companies to return my phone calls. -- From Jim Boulden, CNN Correspondent, in New York. CNN's Adrian Finighan (left), Neil Bennet (center-left) and Alysen Miller (right) meet Robert Redford at the Mobile World Congress in Barcelona. The stands are being dismantled. The delegates are drifting away to prepare for the journey home. Relationships have been strengthened and new ones begun. And so, after four frenetic days, the Mobile World Congress in Barcelona is over for another year. I sincerely hope to be back. As trade fairs go this one is pretty special. Wherever you are and whatever you do, if you use mobile technology in any way, shape, or form what happened here in Barcelona this week will impact your life. From the phone that you’ll upgrade to, to the software you’ll use. From the applications and content you’ll download to the network infrastructure innovations you’ll use without even knowing it. It all debuted right here at this show. But while it’s all so very exciting, the journalist in me is frustrated. I could have filled hours of airtime with coverage of what went on here. Being the premier industry showcase, the big fish in mobile technology are all here and freely available to those of us here to cover it. And while our reporting told you everything you need to know about the main issues of the day, the constraints of TV and the Web mean that I was only able to scratch the surface! And I haven’t even mentioned the little guys. There are so many smaller companies with fascinating stories to tell and exciting products to push that I’d have needed a whole year of airtime to give you a true flavor of the show. Such is the life of a TV reporter! So, what did I enjoy most? Well, meeting and interviewing Robert Redford, urbane and articulate as always, was a high point. And chatting with industry big-wigs and CEOs like Sunil Mittal of Bharti, Jim Balsillie of RIM, Samsung’s Geesung Choi. And with Dan Harple of GyPSii, a mobile social networking platform which, I’m willing to bet, will soon be as big a phenomenon as Facebook. Bigger, perhaps. And of course there were the phones, the new "iPhone killers." My Palm Treo 650 is looking a little tired and if Apple doesn’t release a 3G version of its iPhone anytime soon I’ll be choosing Samsung’s gorgeous new "Soul." Or one of Nokia’s new GPS-equipped beauties. And if I can hang on just a little longer I could take possession of the sublime new Garmin GPS phone which will ship later this year. I loved the mobile software company that was marketing an application that offered real-time translations of both SMS and voice calls, just like the babel fish in "The Hitchhiker's Guide to the Galaxy." But, for me at least, the most exciting innovation on show was the Femtocell, the small white box that may sound the death knell for fixed line telephony. Remember where you read about it first. Time for me to head back to London. So, until February 2009 and next year’s Mobile World Congress, it’s adios Barcelona! Watch my report on the Femtocell here. After four years, I’m standing in a room with the finest press corps in the world. After four years – they’re throwing ME a party. We’ve been through hell and back ... and back again. From Fallujah, Mosul, Ramadi, Tikrit and to the depths of Baghdad – we’ve literally, spilled the same blood, in the same dirt. Corny? Maybe ... But it’s true. We’ve lost friends, loved ones, and colleagues. I choose not to count those who have died, gone missing – or simply disappeared. And that’s not counting those who have made ultimate sacrifice, and are often forgotten: those in the Iraqi press, choosing to try to make a difference in their own country. The numbers of lost are just too hard to imagine. Many of my colleagues have not disappeared here in Iraq – they’ve gone “home” and we’ve never heard from them again. Truth is – what is “home” after four years in Iraq? I wonder how any of us can return home. I’m humbled by a line I saw in a mini-series about World War II: “I wonder how I’ll explain all this when I get back home.” I do wonder how any of us will explain this place. Our families – they don’t know ... and we would not expect them to – how could we? We don’t want them to have the burden of worrying about us. Because if they do, we can’t do our jobs with that on our shoulders along with everything else that we’re faced with. And the simple, humbling truth is: we believe in this ... If anyone didn’t they would not be in this room. We have had “close calls,” we have made mistakes – we stay up at night, wanting the world to care ... But they will never care enough in our minds. So we choose not to sleep. Our tourniquets, bandages, flak jackets, gum, cigarettes, scotch, water, Gatorade, “wily-X eye protection glasses,” boots, radios, “go-bags”, lucky charms and helmets. Don’t leave the bureau without them. Especially the lucky charms – everyone’s got em’ and they work ... Until they don’t ... Welcome to the embed world. Welcome to Iraq. We make jokes (bad ones), band together, and look after each other. We’d lay in front of oncoming traffic for any number of our staff members – everyone is equal here in Baghdad. We cut corners, we give the military cigars – and yes, we lie to each other, party together and forgive each other - because in the end – we’re bonded by something we can’t describe. We love our security – for without them ... You’d see nothing from this country. The sound of silence would be overwhelming from a war that could not be covered without the names of many a former Special Forces soldiers; the names of which – you’ll never hear. Talk about a silent sacrifice. I choose not to name names, not to list those that are forever my friends: rather this simple thought for those who know who they are. These are the finest people I’ve ever had the honor of meeting, and they know full well; I breath this story like it’s oxygen ... And I will be back again. - From Cal Perry, CNN Baghdad Bureau Chief. We are in Guangzhou, China, trying to get a glimpse about why exactly this yearly migration back home for the spring festival is so important. Being new to China, I really didn’t know what to expect about the restrictions on reporting, but after our nosing about at the factory workers dormitories, incurring the rage of the owner of the factory, we had the opportunity to exercise a textbook trick. When trouble looms, change the tape in the camera; they will ask to hand to them what you filmed which you will do kindly and they will get a nice blank tape. Everybody’s happy. The next day, our producer decides it will be great to travel with the migrant workers on a leg of their return home. Rushing down the train station platform trying to keep our correspondent framed and being shoved by people desperately trying to get a seat for the long journey, I realize it’ll be tough. Not even five minutes of being in the train, there’s a heated argument on the other end of the car. Not enough seats, but I can’t afford to give up my camera’s position. A coat over it and a woolly hat make it look like a sleeping person. Very soon, we attract the attention of our fellow passengers. Pictures being taken, sweets offered … the conductor fetches some hot water for our tea. Maybe it won’t be so bad after all. But the novelty and excitement wears off pretty soon: sleeping seated on a hard bench, with equipment all about you, waking now and again to get this or that shot … 10 hours pass – it’s morning and the train is stationary for more than four hours. Pacing up and down the aisle, it seems like a good idea to haul our gear through the window (all doors are locked, nobody is allowed in or out) and hire a car to move to the next station. But we stick by, and 17 hours later, with intermittent sleep, sparse food and no more tea, we get to Changsha, the capital of Hunan province. At least I’ve heard loads of compliments about this province’s food. Here we’ll stop to send our report back to base, and rest on a nice comfortable bed. As we go, we see how many of our fellow travellers are bottled on the next train’s door … again, fighting to get a seat for the next leg of their trip. The roar beats like storm gusts against my hotel window. It is the sound of human voices. If they are using words, they have lost any separate identity. 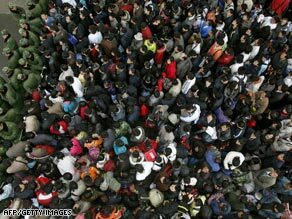 It is simply the sound of a crowd, the elemental unit of Chinese history. On Friday, a woman called Li Hongxia fell before the rushing crowd. By the time, she was lifted clear, she had been trampled by people powerless to avoid her. She died the next day in hospital. Li worked in a watch factory in Guandong. She was trying to get home to Hubei province. But by the count I received a few hours ago, 483,000 people have made it onto trains. By the surf-like roar from the street outside, many many more are still anxious to try. You could only admire her bravery. A stream of pumped-up Chinese police reinforcements was slicing at speed through a tactical opening in the security barricades at Guangzhou train station. The woman, 40ish, slightly built and alone, flung herself into the breach. For a moment it seemed she'd be minced meat. A police officer wrenched her aside and pulled the barricades back together. "I want to go," she wailed. "I want to go." But she was back with so many others, on the wrong side of security, with tens of thousands of people between her and the great prize of a seat on a train heading anywhere. China's current emergency can be seen on one level as an epic collision. On one side: nature, wild and indifferent. On the other: a very human drive to visit family during one slender window each year. It is a deeply intimate story. China's economic rise - and my cheap T-shirts and kids' toys - depend on ordinary Chinese who leave their homes to work often seven days a week in factories in the south. The trip home for Lunar New Year fulfils ancient obligations to family. It is also the only chance most of them have to see family members - including spouses and children - all year. The vast tides of people waiting at Guangzhou might be sources of fascination, curiosity - even incomprehension. They can never be figures of fun. Thirty years ago, the travel writer Jan Morris made a trip from Guangzhou to Hong Kong. She spoke of not seeing people so much as "statistics on the move." A neat line. But the tens of millions currently disrupted by China's weather are no mere statistics. Theirs are all too human faces, desperate to keep faith with their families after for the long months of separation. Their powers of endurance will be remembered long after their occasional flashes of exasperation or anger. Switzerland is a stranger to conflict, having opted out of World War II in a state of neutrality, but some visitors bring their own battle with them. Afghan President Hamid Karzai was in the remote Swiss town of Davos this week as part of his ongoing mission to rally international help to drive the Taliban from his homeland. Though reminiscent of the snow-capped peaks that loom over Kabul, the ski slopes are a far cry from the scarred Afghan landscape – a peaceful picture postcard scene that would set anyone’s mind at ease. But Karzai remains on his guard. CNN visited the Afghan leader in his rented Swiss mountain villa overlooking Davos for an interview that drove home the constant state of peril in which he has spent every day since he took office after the 2001 fall of the Taliban. Before entering the villa, the CNN crew was marched 100 meters along a deserted snow-covered road by a team of security guards. Bags were unpacked, video cameras were scrutinized and each of us given a thorough body check. The equipment is a particular concern for Afghans, who in the days prior to the Taliban’s defeat, lost iconic Northern Alliance commander Ahmed Shah Masood when a suicide bomber posing as a journalist detonated a bomb in a TV camera. Only after we have all been checked -- under scrutiny from almost a dozen Afghan security guards, Swiss police and special agents -- are we admitted to the building, where Karzai is waiting. The level of vigilance surrounding the president is one of the best reminders that his country is still in a state of conflict – one that has come perilously close to ending the life of its leader on several occasions. Karzai himself is, as always, cucumber cool, but clearly pensive. There is a clear contrast the following day when the CNN crew sets up to film Japanese Prime Minister Yasuo Fukuda. Although this takes place within the security surrounding the World Economic Forum in Davos, the event is a markedly relaxed affair. Clearly not as much as Karzai. Hear from CNN reporters across the globe. "In the Field" is a unique blog that will let you share the thoughts and observations of CNN's award-winning international journalists from their far-flung bureaus or on assignment. Whether it's from conflict zone, a summit gathering, or the path least traveled, "In the Field" gives you a personal, front row seat to CNN's global newsgathering team.